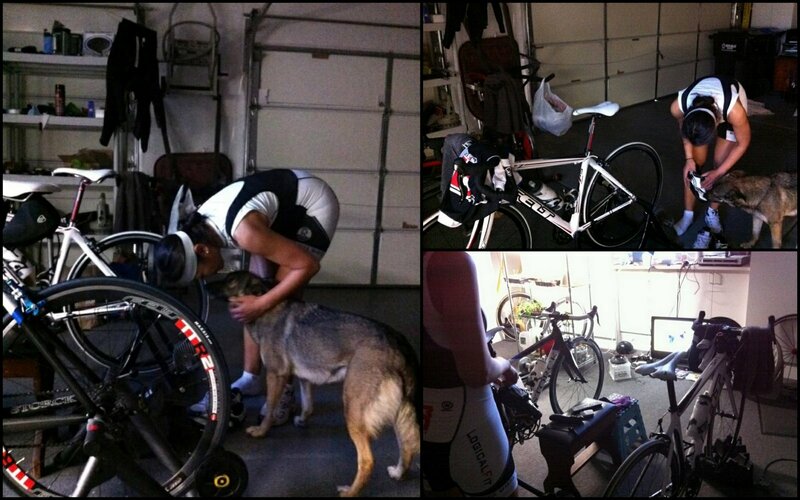 If it weren't for my friend Kaelin, I wouldn't have ridden my bike today. The weather was icky--cold, windy with clouds threatening to pour rain...again. 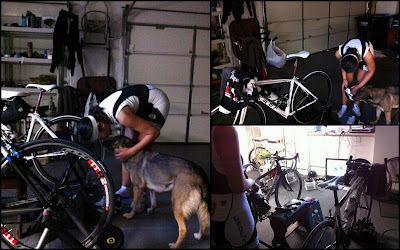 In the shelter of her garage, we rode our bikes on our trainers (an activity if done solo can be mighty boring). For a while we had the garage door open to let in fresh air and sunshine when the weather had cleared. She has a really nice setup in the garage with music and a big t.v. but we had each other and our conversations to keep us company. An hour and a half went by before we had to part so I could get home and prepare for dinner. 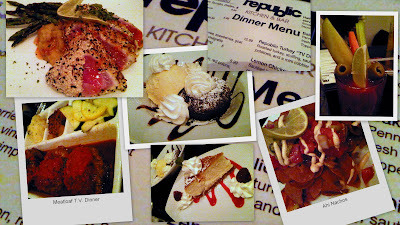 When evening came, John and I met our friends at Republic Kitchen & Bar just after 6:30 p.m.. We had not seen Theresa and Mickey since two Christmas past so there was much to catch up on. Naturally conversing with folks who are so down to earth and easy to talk to came effortlessly. We shared the tuna nachos and everything about our meal from the main course to dessert was just fabulous. John and Theresa ordered the meatloaf dinner served in t.v. dinner tray--I thought it was such cute a presentation, LOL. I had seared ahi tuna and Mickey ate short ribs. Before we knew it, the clock clicked past 10 p.m. - later than all of our bed times. When training indoors and dinner goes by way too fast...that's how I know I was in good company! You could wear a video camera on one of your rides, then show it on the garage tv as you peddle. Just need to hook up a resistance computer synchronized to the video, so you could relive the hills too. I love your suggestion, Joe and just need one of those gadgets (I've seen others use them). I'm not sure I want to relive those hills though ;-) It's bad enough when I have no choice but to physically pedal up them LOL. hi sis Daly how are you?